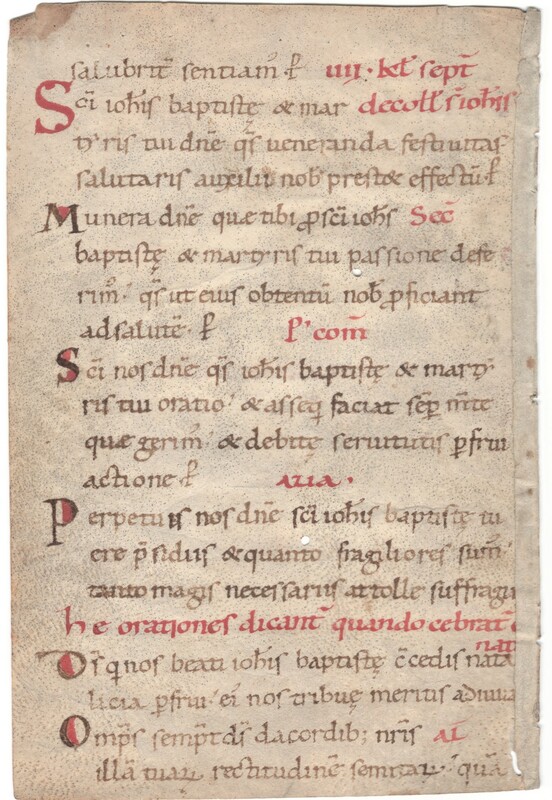 Leaf from the Sanctorale of an exceptionally old Sacramentary. Single folio on vellum. Central Italy, ca. 1050: 203 mm x 136 mm (justification, 183 mm x 105 mm, not counting the litterae notabiliores). Ruled in dry-point. Single column, 20 lines. 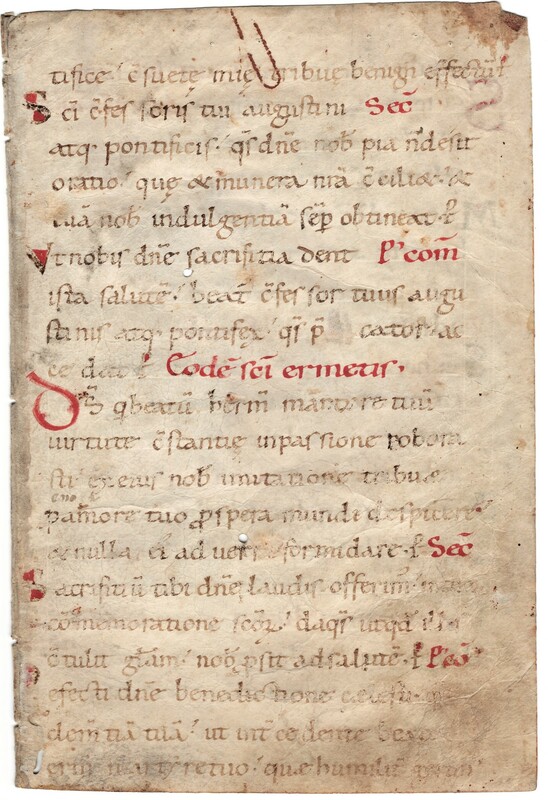 Decoration: two large initials in red marking each of the Sanctorale masses; nine litterae notabiliores in black with red highlights identifying each section of the mass. Text: Before the invention of missals, which emerged around 1000 AD, a variety of compilations would have held the texts required for performing mass. Because our manuscript preserves Collects, Secrets, and Postcommunions (prayers, essentially), it is called a Sacramentary. The celebrant himself would have recited these particular texts, and because multiple volumes would have been used, it makes sense that ours would be portable. The prayers concern the feasts of St. Augustine (28 August), St. Hermes (28 August), and the Decollation of St. John the Baptist (29 August). St. Hermes is the outlier here. He was popular across northern Europe, especially in German lands, but not widely in Italy, where he was culted largely in Rome and its environs: Spoleto (some of his relics were there), Lucca, and Acquapendente (relics). Condition: formerly a fly-leaf from a binding, therefore cut down, worn (though entirely legible), soiled, and very slightly wormed, with the rust mark of an old paper-clip on the recto. Provenance: from a California collection identified by the seller as “Samuelson Collection,” and labeled “25,” along with a note in modern pen on a small slip of paper that was paper-clipped to the folio.